The matter of grass-fed beef and dental hygeine has me thinking some more about the connection between cuisine and agriculture, or between what we might think of as personal or cultural preference and the on-the-ground facts of how food is raised. A couple of weeks ago Melissa Clark had a recipe in the New York Times for boneless chicken breasts — essentially chicken cordon bleu with sauerkraut, which cries out to my Alsatian-Rheinischer soul, but equally interesting to me was her hand-wringing about white meat. The food snob in me has long rejected them as dry and bland and boring. 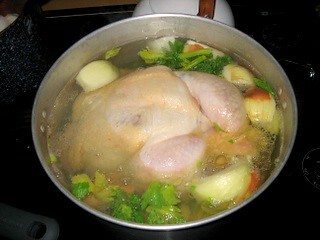 Why eat chicken breasts, I’ve long thought, when the thigh is more flavorful, the tail more succulent, the wing crisper? Then I bit into the drumstick of a farmers’ market bird. And I chewed and chewed. The flesh was earthy, intense and nicely gamy, but it was also as tough and springy as Spandex. Half a leg later, I gave up. “A Fallen Star of French Cuisine, Restored to Its Silver Platter,” New York Times, 13 January 2010. She points out that “There was a time when the French culinary elite esteemed chicken breasts above all other parts” — a hundred years ago, when chickens walked or even flew about the barnyard all day. All that activity works the muscles, making them more flavorful but, yes, tougher. The breast meat, meanwhile, develops a nice flavor and firmness. Put the fowls in a coop and feed them moderately for a fortnight; kill one and cleanse it, cut off the legs and wings, and separate the breast from the ribs, which, together with the whole back, must be thrown away, being too gross and strong for use. Take the skin and fat from the parts cut off which are also gross. The Virginia Housewife, pp. 18–19. Note that Mrs. Randolph calls for an old fowl — most likely a laying hen who had quit laying at the age of three or four. Hence her instruction to dispose of the ribs and back, which would be tough and strong (or “gross,” as she so delicately puts it) from years of irritable head-bobbing and wing-fluttering. Today, when I want to make chicken soup, I’m practically ecstatic to find chicken backs, but even the backs I buy at the farmers market are from young chickens. I’ve made soup from an old laying hen, and oh my it had some flavor — but delicate, it was not. So I see Mrs. Randolph’s point. Just as with grass-fed beef, then, a chicken that’s allowed to live some semblance of a natural life is going to have to be treated differently in the kitchen and on the plate. Which means that, again, if we’re going to go all cultural-history on the way people used to eat, we’ve got to understand animal husbandry and crop science and avian physiology and food chemistry and all sorts of other fascinating complicated things. Which is either wonderful or deeply annoying, depending on your perspective.